Tradícionális hordógyártás - Piroli Kft. The Piroli Cooper Ltd. is established in Erdőbénye a traditional and charming village situated in the most outstanding and reputable Hungarian wine-producing regions named: Tokaj hegyalja. This historical growing region has been holding an emblematic role in Hungarian viticulture and is known for its excellent vineyards where traditional daintiness has been carried on over various generations. 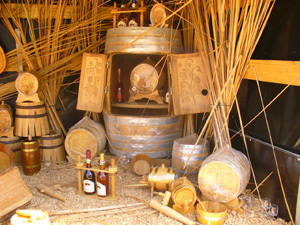 To produce good wine today the high quality oaken barrel is just as indispensable as it used to be in the time of our forbears.The barrels and casks are produced by carefully trained coopers having widely acknowldeged professional expertise.Their profession is one of the oldest existing crafts bearing a history of hundreds of years. Our company represents an invaluable experince in this profession which is based on expertise passed on from father to son. Our family has been producing cooperage for over 4 generations and besides the above mentioned products we also design and implement hand-carved furniture and individually constructed saddles for long distance riding.Our primary focus is to provide unique quality and we are at all times ready to discover new possibilities to fulfill individual needs and face special challenges. We pay careful attention to each and every request of our customers maintaining a friendly relationship with them and making sure that their ideas are materialized precisely. We have gained great customer satisfaction by sharing our experience and opinion regarding our products thus we have a very reliable and dynamically improving cooperation with our partners. Our cooperage is strictly hand-made following traditional techniques.Our basic masic material is the Durmast Oak ( Quercus Petraea ) which we select with extreme daintiness. The most conevenient material for our purpuses is the Durmast Oak which posesses outstanding fibre quality and is internationally acknowledged due to its incomparable flavour and fragrance quality. During the oxidative curing the wood of the barrel significantly influences the colour and the arome of the wine. Our painstakingly selected materials consist of splitted staves only, as we must split wood corresponding to the direction of its fibres in order to reach the highest quality.Our staves are of 35-38 mm which ensures a long lifetime of the product and also allows maintenance treatments of the barrels. 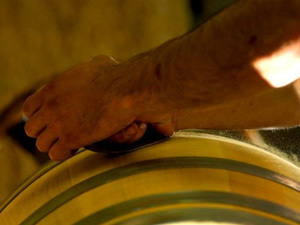 Removing the internal layer of the cask ( approximately 2-3 mm) it can provide new falvours to the wine again, thus, the barrels are recyclable and help the customers decrease their costs considerably. The staves that we use go through multiple detailed controls before they are selected and arranged for the drying procedure. The staves are grouped according to their length and left in an open- air place where the wind, the rain the sunshine and the snow can contribute to the natural drying process and ensure the departure of all maleficant substances from the wood such as tannins. After a minimum of a 2 years natural drying the staves undergo another quality control and following this the actual production of the barrel can begin. 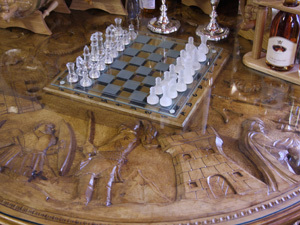 The staves are cut to the appropriate length and treated with several special tools and machines. To erect a barrel we use an iron hoop and from this step we begin bending the staves and shaping them above the fire. 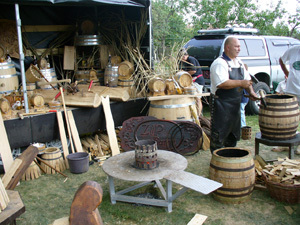 The fire is nourished exclusively with the same kind of wood as the one of the barrel itself. Heating staves makes us able to bend them to their final shape.Once this step has been completed we continue by one of the most important procedures: calcination. The intensity and length of calcination influences the flavour and fragrance of the wine significantly. If you send us your requests, questions or orders via any of the above mentioned contact possibilites our customer contact representative will reply to your shortly corresponding to your availability and will send you our offers designed personally for you.